Emboldened by its military gains, the Syrian regime is reasserting its authority over loyalist militia groups, in order to reclaim the state’s monopoly on the use of force. Toward this end, Damascus has undertaken measures to incorporate pro-regime groups into paramilitary forces under the command of the army. Understanding how this works – a process that remains barely acknowledged outside the country – is important in determining how it supports long-term stability. Hint: it doesn’t. Many groups fall under the rubric of “loyalist militias.” For example, there are those funded by Iran, such as the National Defense Forces (NDF); groups established by individuals, such as the businessman Rami Makhlouf’s Al Bustan; groups funded by non-Islamic religious organizations, such as the Christian Quwat Al Ghadab; militias established by the Baath party; tribal militias, such as Suqur Al Furat; groups affiliated with the military or state intelligence units; and foreign militias, such as Hezbollah. These affiliations, however, are not mutually exclusive, as some militia groups owe allegiance to, or receive support from, more than one party. Despite their role in helping the regime avoid loss to rebel forces, loyalist militias have posed challenges to the authorities and to the stability of the state. Their extensive number and the lack of a unified management structure has limited the regime’s ability to control them. They engage in criminal activities, such as human trafficking, kidnapping and extortion. They have also been able to establish parallel centers of authority, leading to power struggles and frequent clashes with the regime’s conventional forces. As such, it makes sense to try to rope them into army control. The integration process varies, depending on local conditions and rivalries. And while the exact criteria used to prioritize groups for integration remain unclear, some outlines can be discerned. It generally appears that militias are dissolved and reabsorbed elsewhere if they reject deployment to another area, if they compete for area control with more influential groups or figures, or if their engagement in illegal activities attracts too much public attention. Integration also usually take place in areas that have been secured, where the presence of armed groups is no longer necessary. For example, many loyalist militias in Barzeh, Ish Al Warwar and Dahiyat Al Assad, all secure neighborhoods north of Damascus, were dissolved, especially those affiliated with the NDF and the Baath party. Similarly, the regime is disbanding the lion’s share of militias in the province of Hama, after the de-escalation of fighting there. 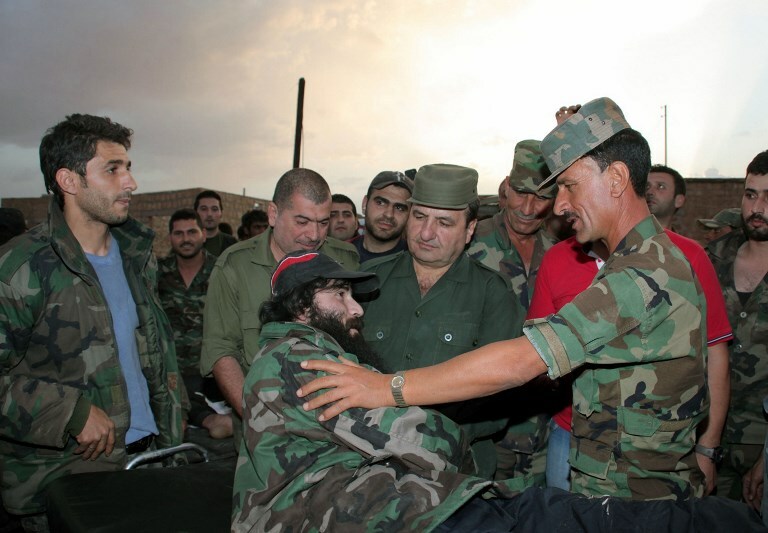 Once a decision is made to disband a militia, its members are treated according to their conscription status. Those subject to the draft – males aged 18 to 42 – who have not yet fulfilled their military-service obligations are required to join the army. In some cases, the regime has asked militia groups to send all draft-age members over to the army, regardless of their conscription status. Some government employees who joined pro-regime militias have been told to return to their old jobs or face being fired – and thus lose the pay they still have been able to draw. Those not subject to conscription or required to rejoin government work either can be demobilized or they can join the regime’s paramilitary forces. To serve the latter end and absorb potentially tens of thousands of combatants, the regime, with Russia’s support, created the 4th Assault Corps, a volunteer unit. Sources in Syria tell this writer, however, that this experiment has not been successful because of a lack of cooperation by Iran, and as a result only a handful of loyalist militia members joined. To address that failure, Russia took the lead in creating the 5th Assault Corps in 2016. This has been partially successful, allowing the regime to assert control over former militia fighters numbering between 10,000 and 15,000. Likewise, the regime brokered a deal with Iran to bring a large number of militiamen in Local Defense Forces into the regime’s “emergency forces” – units that can be called up on an ad hoc basis, such as in times of war. The regime also has incorporated some militia groups into elite security agencies outside army control. But here, they are given hybrid status: while nominally under the authority of an established agency, they continue to operate more or less independently. For example, the Coastal Shield unit, or Dara’ Al Sahel, funded by Iran, was inserted into the Republican Guard. Likewise, militias in Al Hamah and Qudsaya in the rural outskirts of Damascus were integrated into the 101st Brigade of the Republican Guard. All in all, the integration initiative has allowed the regime to incorporate a sizable number of loyalist militia groups into the state’s auxiliary forces. Nonetheless, these efforts have resulted mostly in changing the “brand” of the militias. Individuals within these groups remain loyal to their original backers rather than the state. Moreover, much of the integration effort is being led by Iran and Russia, and the overly large influence of these two foreign powers in Syria’s armed forces will continue to undercut regime legitimacy, as well as create rivals within the military structure. Without real political and institutional reform, efforts to co-opt loyalist militias into the armed forces will serve only to magnify differences over loyalty and goals within the military establishment. Rather than reclaim the state’s monopoly on the exercise of military force, the Assad regime is incubating more problems it will eventually have to address. And chances are, those problems will manifest themselves violently.